Today Саstellini is yet another dignity of Italian design and symbol of premium dentistry. Brand’s units have been delivered to the best clinics worldwide for more than 80 years. 15 years ago UNIDENT started to supply machines with prestigious (СА) Саstellini mark to Russia. When we mention Italian design famous names come back to mind: Armani and Versace — fashion, Pininfarina — motor industry, Sottsass and Pesce — interior. Perfect harmony and impeccable taste is a symbol of the Italian style. Many people attribute this to special optics developed by citizens of Apennines historically as there are architectural masterpieces everywhere. Italians themselves believe that their passion for beautiful things and ability to turn any thing to works of art arise out of a special attitude to life. As iconic Italian designer Gaetano Pesce once said, “things should improve life, add warmth, colour and feelings to it. Design purpose is to improve psychological health of a man, make life comfortable and happy”. It is not a function of a thing — dress, coffee machine, motorbike, or dental chair — that is important. Made in Italy means beautifully crafted. Саstellini machines are hi end equipment. Every attempt was made to manufacture the CA marked unit in such a way as to allow a dentist to work easily and enthusiastically and patient to feel himself/herself comfortable in a chair. It is equipped with hi-tech digital systems including appliances, radiological systems, imaging systems, sensor control elements, which allow for setting up working parameters. But it was not always that way. 80, 50 and even 30 years ago all equipment was mechanical or manual. Саstellini is among those companies which helped to make the dentistry while promoting new technologies painless, safe, and accurate as we know it today. Each Castellini unit is fitted with a dozens of certified systems. Much attention has been given to ergonomics for dentists to enjoy the comfort of their work; to hygiene of the equipment as such and surrounding objects; to imaging necessary for a dentist to have a complete picture of the patient’s oral cavity as well as reliability of all units and systems as a whole. A modern dental unit is a combined machine encompassing more than one “specialties” related to implantology, endodontology, and diagnostics. Multifunctionality is a trend of out times. 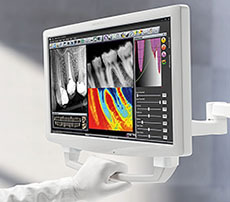 But Саstellini looks to the future: it plans to achieve in the immediate future a potential objective that is to provide online support for connected equipment for dentists to rely on such online support and automatic updates once done. Among the customers of Саstellini and UNIDENT are best state clinics of Russia including the Ministry of Foreign Affairs of the Russian Federation, Central Bank of Russia, Moscow City Government, Moscow State University of Medicine and Dentistry, Central Scientific and Research Institute for Stomatology. Over 700 units were supplied to state institutions. Some meetings were determined by the history itself. That was the case with UNIDENT familiarisation with Castellini. By 2004, after 10 years of meritorious work the Russian distributor had been prepared for bringing hi end dental equipment to Russia and CIS. That was an ambitious project. It was planned to supply premium equipment To help to meet the demand of premium dentistry. In 2004, UNIDENT was granted an exclusive right to supply Castellini units to Russia and CIS, and in 2006, its employees visited Italian production plants and saw how VIP dental equipment is produced. “It was clear at the first visit to the plant: Castellini is uncompromising when it comes to the quality”, said associates. Italian style was striking: there was a shop at the plant where trained engineers disassembled used units (home-made and those of competitors) by screws to gain a better understanding of how and why the equipment breaks down. Joyful atmosphere reigned over the plant was also astonishing — love of life in all its manifestations. Of course, perfection of the product produced that is equipment looked like an objet d'art was fascinating. No random detail, no rough line, no shadow of incompleteness. Material with memory effect adjusted to the shape is used for upholstery. This makes patient’s chairs comfortable. Castellini is sure that the passion for perfection is characteristic feature of highly knowledgeable specialists. A doctor is anxious to provide a patient with the best services, and dental equipment supplier to allow healthcare professionals to use the best technical facilities, and manufacturer to create such a unit which would make treatment as efficient and comfortable as possible. Quality philosophy and exclusive style are thus being formed. 15−year fruitful cooperation between UNIDENT and Castellini is based on shared understanding of dental specialties and desire to develop this industry to the benefit of patients. Castellini products have already been recognised by professionals in five continents in 70 countries including CIS. Regional Sales Manager of Cefla S. C.
“Since we built partnership with UNIDENT our cooperation has been developed continuously. That is why we say that our most successful year is always the next year. This positive trend strengthens our partnership. We hope that each dentist using Castellini products is entirely satisfied with quality and reliability of selected equipment and high standards we meet today and will meet in future together with UNIDENT”.